Maine Power of Attorney Forms is the type of paperwork that allows someone to grant special authority to another individual to act on his or her behalf. There are different types of forms. Some forms are drafted for specific purposes while others can be for a broad range of authorities. It is extremely important that the person you choose to confer authority upon is trustworthy and reliable. This person, or agent, will, upon principal approval, have access to your financial affairs or other personal matters. All forms should comply with Title 18-A, Article 5 of the Maine Revised Statutes. Advance Health Care Directive – This form allows a person to appoint a friend or relative to act for them with regard to health care decisions in the event they are unable to do so for themselves. Durable Power of Attorney – This document allows the person creating the form to appoint an individual to make financial decisions on his or her behalf. The authority lasts through the incapacity of the principal unless it is revoked prior to such incapacity. 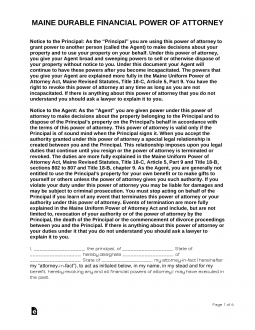 General Power of Attorney – This form is similar to the durable type, except that it becomes void upon the principal’s incapacity. It allows a principal to appoint a trusted agent to manage financial matters for the benefit of the principal. Limited Power of Attorney – This type of document can be tailored to a limited or specific situation or transaction. Minor Child Power of Attorney – This type of document allows parents to choose someone to be in charge of their children for a temporary period of time and make health and educational decisions for them. Power of Attorney Revocation – This form is used when you want to revoke a power of attorney. It can be used for any type of power of attorney you created in the past. Signing Requirements: None, but a notary acknowledgment is recommended. Real Estate Power of Attorney – To choose someone to handle a property transaction or the management for a specific amount of time or until the landlord’s death or incapacity. Tax Power of Attorney Form ME-2848 – This type is used when you want to appoint an accountant or tax attorney to handle your tax matters. Vehicle Power of Attorney – This form allows the principal to appoint a person to act for them with the Bureau of Motor Vehicles.